Red Bull Lime Edition is a sugar-free flavor variation of Red Bull Energy Drink. 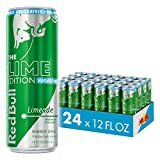 Its flavor is described as limeade and is artificially sweetened with sucralose and ace-k.
Lime Edition is part of a growing Red Bull Edition line-up and has the same caffeine as the other varieties. Red Bull Lime Edition should be consumed by healthy adults only. How Does Red Bull Lime Edition Compare? Red Bull Lime Edition contains 9.50 mgs of caffeine per fluid ounce (32.12mg/100 ml).